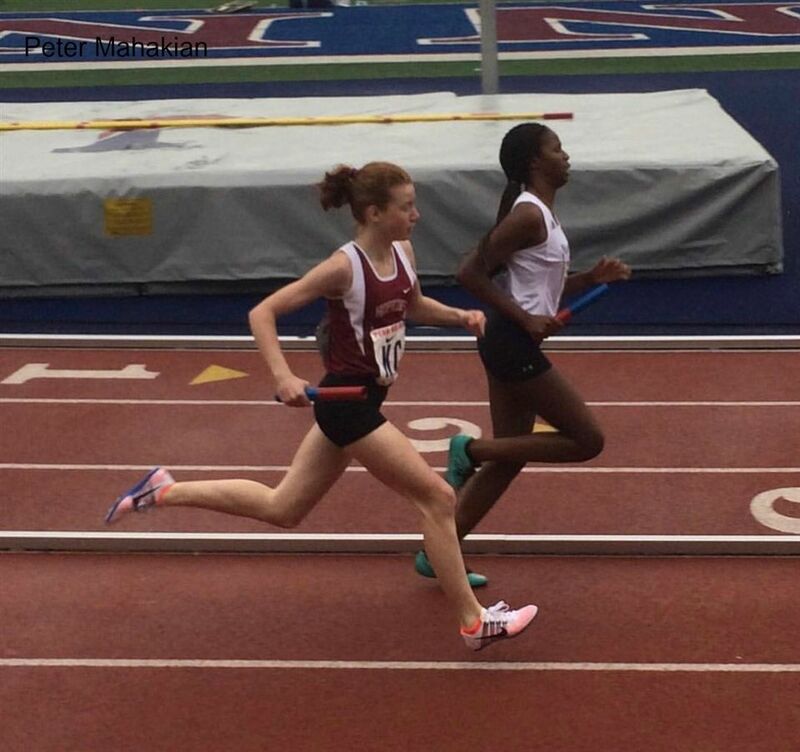 Madeleine Walker ’19 competes at the Penn Relays. I knew I was dependent on running when I eagerly climbed into a tank pumped full of -264 degree liquid nitrogen in an attempt to heal a persistent running injury. For better or for worse, I’ll do anything to be able to run. Running isn’t a constantly joyous experience, don’t get me wrong, but the high points of running wouldn’t be quite as high without some low points to compare it to. The reason my stomach tries to massacre itself while I’m standing on the start line of a race is because I know the pain I’m about to endure. But, I’ve realized that no matter how much pain I go through while running, I have never enjoyed any activity more, and not being able to run is exceedingly, indescribably more painful than running itself. Like most people, when I frst started running, I hated it. I ran my frst race when I was 10 years old, and the only reason I pushed through the pain was because I was determined to beat my older brothers. I was always a little too competitive with them, but running was the greatest challenge I had come to and I couldn’t not try. My greatest motivation for running is improvement in races. I had passed my brother, so I started setting new goals: get top ten in public school state championships, fgure out a way to run up hills without my asthma taking over, beat 6:20 for the mile, beat 5:10 for the mile. Running started out as a competition, and it still is, but now it just feels right. I know that doesn’t make sense to many people because running can be brutal, but running is the closest feeling to “home” that I will ever have. One of the sights I fnd most calming is the bob of a headlamp’s glow on the pavement in front of me when I run after dark. My race uniforms have so much sentimental value that I conveniently “forget” to return them after every season. I fnd so much joy in running, and I can sympathize with people who say that running is too diffcult or boring for them, but I have yet to fnd a sport that is comparable. from a cold. If you want to calculate your lactate threshold at a running summer camp, you’ll have to run increasingly faster for every half-mile and get your fnger pricked to test your blood-oxygen levels until you either faint or collapse from exhaustion. You’ll fnish a time trial with a 10-second improvement, but the sweat dripping into your eyes will feel like Satan is punishing you. Most of your summer job earnings will go towards buying the kind of running socks that don’t give you blisters. Your body may be dying, but completion of a workout is indisputably satisfying, and only part of the fun. There is mental pain, too, but that’s even more motivating. Getting cut off by younger boys during a workout because they refuse to be beaten by a girl (even if it’s just practice) only makes me want to run harder, and being pitted against my best friend Maliya to see who is truly the fastest on varsity only makes me want it more. I have dealt with so many emotions from the sport that I have become completely dependent on it, which is why getting shin stress fractures in August and being prohibited from the sport for fve months has been more brutal, mentally and physically, than any running I have ever done. Not running became a loss of identity. I was no longer the girl who could run to her friend’s house when she didn’t have a ride, or hit the pavement between exams to clear my mind. Instead, I became the girl who was always on the stationary bike, elliptical, or aquajogging. Rather than rolling out my muscles and doing dynamic warm-ups, I have to endure Chinese cupping therapy and photon laser scans. I don’t get to hear my friends’ stories during runs anymore, and I constantly have to wipe my sweat off the foor of the ftness room because I’m trying to keep up with the team while not being able to actually participate. I will always want to run full-speed ahead, but I’ve learned that if I want to run healthily for the rest of my life, I have to start out slow and ease back into it. Running is funny that way. It beats up your body to do it and it messes with your mind when you don’t. My dad says that he wants to die face-down on a trail during one of his long runs at age 102 because he wants to die happy. I couldn’t agree more.